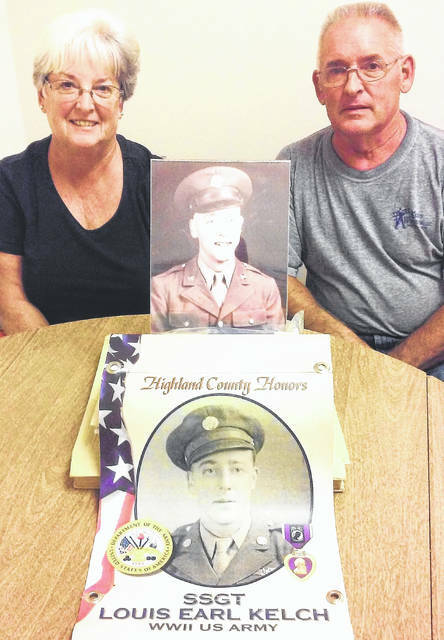 Cheryl Lyle and Daryl Kelch are pictured with mementos of their father, U.S. Army Air Corps Staff Sgt. Louis Kelch. The explosion that hit Staff Sgt. Louis Kelch’s B-17 Flying Fortress doomed the lumbering, olive drab aircraft. In a published interview from 1991 that appeared in the former Hillsboro Times, Kelch, who passed away in August of 2000 at the age of 78, said he didn’t hesitate to bail out of the stricken plane. The B-17 bomber had four engines, but an exploding flak shell hit a fuel tank which exploded in the wing. The big bird began to spiral downward toward the German countryside near Brunswick Air Base. Kelch said in 1991 that he vividly remembered his very first parachute jump, bailing out at 22,000 feet on April 11, 1944 at 10 a.m.
“I remembered what I was taught and it came back automatically from sleeping through the classes,” he said in the former interview. Kelch was part of the 306th Bombardment Group, nicknamed “The Reich Wreckers.” He had been in Europe since Feb. 24, 1944, and was flying his ninth mission, which had a target in Poland as its objective. Twenty-eight minutes after he bailed out he was met on the ground by a German farmer with a shotgun and a German soldier, who began arguing over who would get the credit for capturing an American flyer. “The farmer was to get a reward for all the airmen he returned, but the soldier was there, and they had quite an argument about it,” Kelch told the Hillsboro Times. Kelch never did find out if the farmer got credit for his capture since he was taken to Frankfurt, Germany to the Dulag Luft interrogation center, where another aspect of his training kicked in. After that, the prisoners boarded a train for Krems, Austria, and spent the next 13 months at Stalag Luft 17-B. According to author Eric Ethier, who wrote an article about the German POW camp in the February 2006 issue of “America in WWII” magazine, it was a sprawling eyesore and a den of misery nestled in the middle of the beautiful Austrian countryside of rolling hills and thick forests. By the spring of 1945, Ethier wrote, all kinds of ugly secrets were coming to light from Hitler’s dying Third Reich, and some of those terrible truths had to do with the prison camp that Kelch was at. When Kelch and his air crew arrived over a year earlier, the American population of the prison camp had swelled to more than 4,200 as the allies intensified their strategic bombing campaign. Conditions in the prison camp were deplorable at best. In his article, Ethier described Stalag Luft 17-B as a series of long, single-story buildings that housed the fliers. Each one was divided into halves shared by 150 to 240 men, who also shared straw-filled, flea-infested mattresses in triple-deck bunks. For heat, there was a single stove that got a ration of 54 pounds of coal per week, wash basins that had cold water for only a few hours a day, a single latrine for nighttime use and outhouses a short walk from the barracks for use in daytime hours. There was no hot water or showers, nor did the prisoners have basic bathroom hygiene supplies. Diarrhea and dysentery were constant companions. The daily menu was just as bleak, according to Ethier. For breakfast, their Nazi captors provided warm water, which many of the men used to make coffee. Lunch consisted of a few crusts of dark bread, and dinner was usually a thin soup made of potato or rutabaga, but more often than not fish heads or other discards were served floating in warm water, Ethier wrote. If they were lucky, each POW received a Red Cross package once a week about the size of a shoebox that contained canned tuna, cheese, dehydrated milk, a tube of liver paste, and raisins along with margarine, sugar, several packs of cigarettes and two condensed bars of chocolate called D-bars. More often than not, according to Ethier, the Red Cross packages never made it to the soldiers, disappearing en route. In Ethier’s article, one prisoner remembered receiving just a single box during his eight month’s in captivity. The only time Kelch’s son, Daryl, could remember when his father actually watched a movie about the war was when he was recovering from an illness while staying at his other son’s home in Winchester. After the war, Kelch opened a successful woodworking business that was in operation for 36 years. How did the war affect his life? That question was posed by his grandson, Ryan Kelch, who interviewed his grandfather on audio cassette for a school project on March 14, 1993.
https://www.timesgazette.com/wp-content/uploads/sites/33/2018/09/web1_Cheryl-Lyle-n-Daryl-Kelch.jpgCheryl Lyle and Daryl Kelch are pictured with mementos of their father, U.S. Army Air Corps Staff Sgt. Louis Kelch.